Read the remarkable true story of a young boy's journey from civil war in east Africa to a refugee camp in Sudan, to a childhood on welfare in an affluent American suburb, and eventually to a full-tuition scholarship at Harvard University. 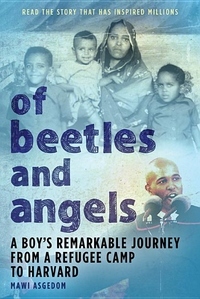 Following his father's advice to "treat all people-even the most unsightly beetles-as though they were angels sent from heaven," Mawi overcomes the challenges of language barriers, cultural differences, racial prejudice, and financial disadvantage to build a fulfilling, successful life for himself in his new home. Of Beetles and Angels is at once a harrowing survival story and a compelling examination of the refugee experience. With hundreds of thousands of copies sold since its initial publication, and as a frequent selection as one book/one school/one community reads, this unforgettable memoir continues to touch and inspire readers. This special expanded fifteenth anniversary edition includes a new introduction and afterword from the author, a discussion guide, and more.